What do you do when your soon-to-be two-year-old can’t decide whether she wants fairies or ballerinas at her next birthday? You give her a fairy ballerina birthday, that’s what. 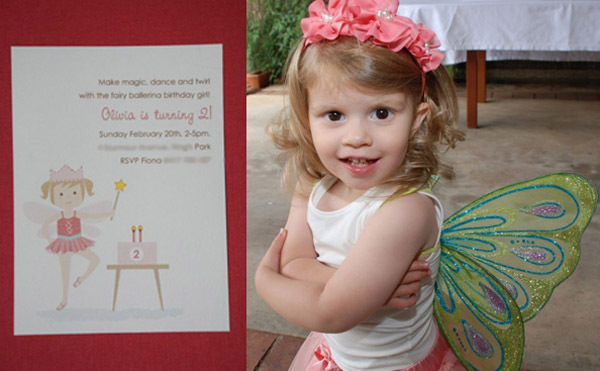 Fiona – a self-confessed party tragic like most of us here at Babyology – took two typically girly fetishes and turned them into something else all together to create a second birthday party bursting with fairy magic for daughter Olivia. We’re very impressed with Fiona’s sweets table. You could be forgiven for thinking she called in the professionals, but no. 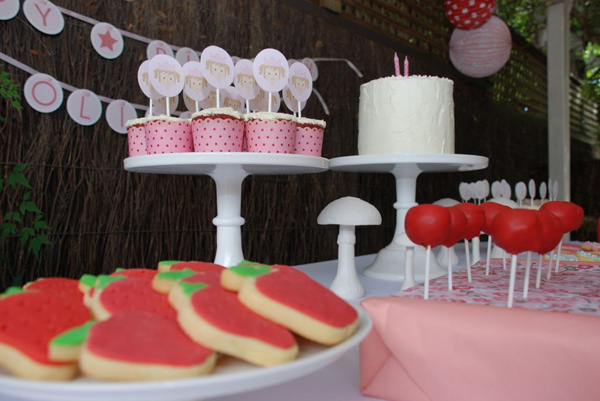 She made and decorated all the sweets herself, including the red velvet cupcakes, the cute strawberry, apple and butterfly biscuits, the pop cakes and the rather impressive pink layered birthday cake. The recipe for the pretty birthday cake and the biscuits came from Martha Stewart and the shaped cookie cutters from The Raspberry Butterfly and Little Betsy Baker. And here’s a tip – Fiona used Wilton’s White White Icing Colour in her buttercream frosting to get that perfect shade of white. 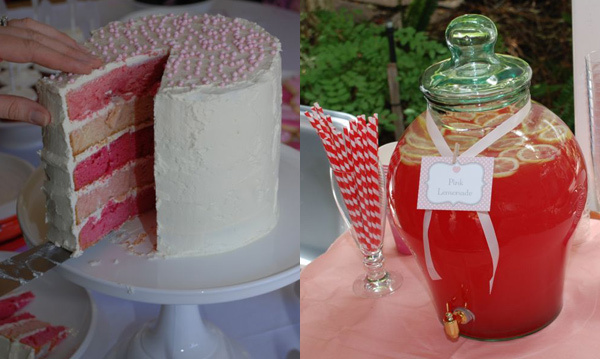 The milk glass pedestal cake stands used to display the treats are especially gorgeous. I’ve been coveting these for some time but had no luck finding an Australian stockist. Now, thanks to Fiona, I know to find them at Donna Hay General Store. 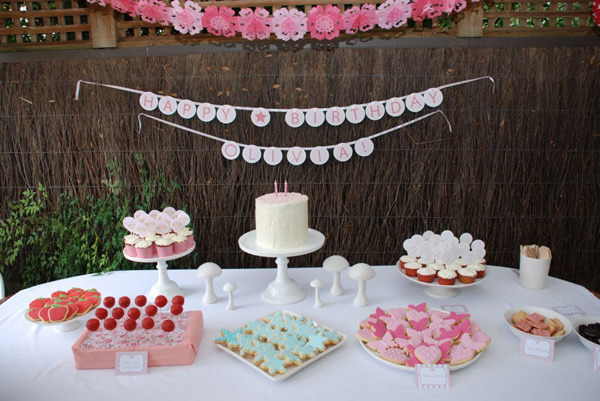 Martha Stewart was also the source for the pretty pink paper lanterns, while the pink paper garland came from one of our own favourites, Lark, along with the paper straws. The tabletop mushrooms were a lucky find at a Laura Ashley store in Adelaide in the lead-up to the party. The cute-as-punch birthday girl (below right) fluttered and pirouetted her way through the party in a stunning fairy tutu skirt from Tutu Du Monde and singlet from Seed. While there were no fairy godmothers on hand, Fiona did have two fairy grandmothers to prepare all the savoury tidbits for the party guests. And she kept her fairy ballerinas busy with a treasure hunt, fairy bowling (coffee canisters covered in pretty paper as bowling pins – marvellous!) and trampolining. 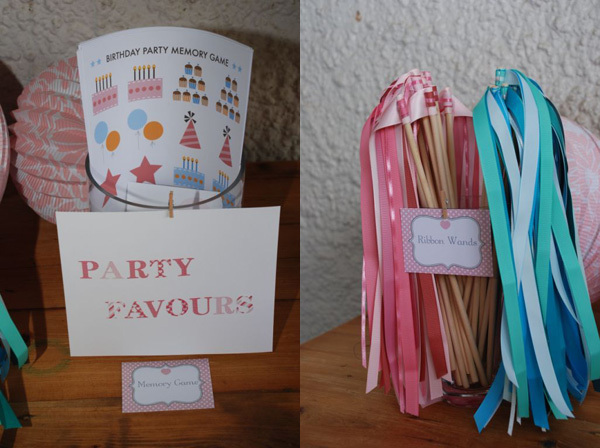 All the party printables – the invitations, thank you cards, cupcake toppers and the birthday banner – were custom designed by US graphic artist Meg from Olliegraphic. 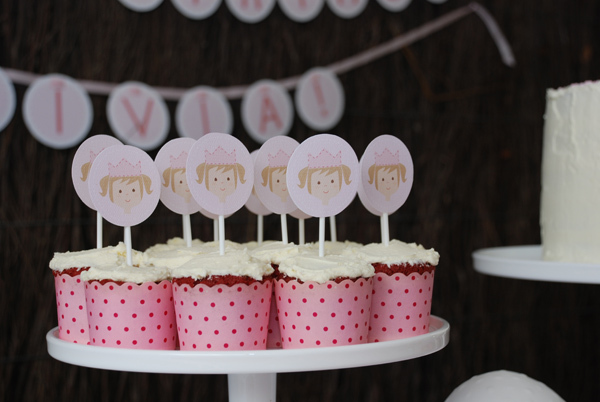 We adore how the pig-tailed cutie on the cupcake toppers and invites looks just like the birthday girl! But our favourite touch? Of course, it has to be these delightful ribbon wands that Fiona also made herself, with unexpected help from husband Darren. Aaaww, there’s nothing some dads won’t do for their little girls!